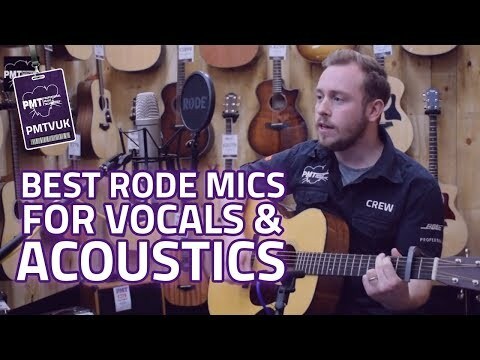 The Rode NT1-A Microphone Pack brings you the best-selling of all Rode microphones in a bundle that includes everything you need to begin cr.. The Rode NT1-A Microphone Pack brings you the best-selling of all Rode microphones in a bundle that includes everything you need to begin creating professional sounding recordings. With its large 1” capsule with gold-plated diaphragm, internal capsule shock mounting, wide dynamic range and ultra-low self-noise you have the potential to get seriously fantastic professional level recordings with the Rode NT1-A. Since its release, the Rode NT1A microphone has rightfully earned its place as an industry standard condenser microphone, being used on hit songs recorded all over the world. Thanks to its extremely low self-noise level of only 5Db (A), along with the Rode NT1, it is known as one of the world’s quietest studio microphones. With its incredibly low noise level it makes for one of the best microphones for recording vocals and it’s also ideal for recording guitars and percussion. The Rode NT1-A comes packaged as part of the ‘Complete Vocal Recording Solution’ bundle which includes everything you need to start getting a professional vocal recording and is a great vocal microphone for home studio recording. A studio grade pop-shield which helps prevent unwanted breathing sounds and plosives spoiling your vocal recordings. A premium 20ft XLR microphone cable. A protective pouch for keeping dust and debris away from your Rode NT1-A. If you need some help getting started or want to learn a few tricks of the trade from professionals, the included NT1-A Studio Secrets DVD is packed with helpful advice and techniques so you can get the most of your recordings. Also, when you register your purchase with RODE you get an industry leading 10-year warranty to cover your new Rode mic. I just got hold of this pack a week or so back, I was just looking for a cheap condenser mic to be honest, and this definitely does the job. The mic itself feels pretty solid, and (from recordings) sounds like it picks up some way above other mics in the price range. Sound is quite clear on 48v phantom, and it sounds good if very slightly off axis. The pack also contains a shock mount, which seems pretty stable (after I fixed it...see below), a standard XLR cable, a RØDE branded pop shield and a pouchy thing to keep it in. The mic is also eligible for RØDE's 10 year warranty. I have a slight gripe with the fittings of the shock mount however, as on mine the screw on the hinge (that fits into the bit between the shock mount and the bit that fixes onto the mic stand -- whatever that's called) was too small to thread in properly and couldn't support the weight of the mic + cable + shock mount + pop shield, although managed to fix that with a 6mm screw from B&Q. Have contacted RØDE about this, waiting for reply. Overall would recommend this to anyone looking for a cheap condenser, it does the job well, probably would have paid a few quid more to be honest. If you are on a budget and need a mic but don't have the accessories to go with it, then this is the one to get for a cheap vocal solution, podcasting, streaming, broadcasting, etc.